So I've had this photo of the Mr. for a few days and have wanted to post it. It's him enjoying a sun spot. Mr., and countless other cats, LOOOOOOVE the sun spot. But it was just another cute cat pic. Maybe it had some photographic merit in that there was some really nice contrast of the white cat in the sun spot and the rest of the room was fairly dark. But, still, another cat pic. 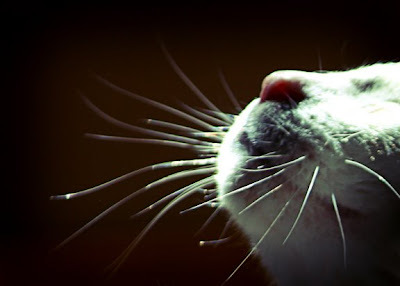 Until, his whiskers caught my eye and I cropped into to just that. Then played just a little. If that's not a cat basking in a sun spot I don't know what is.